Thanks to all of you who have become Cloudeight members! Welcome to all our new members too! 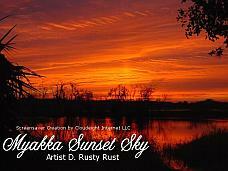 We are pleased to present our "Myakka Sunset Sky: The Art of D. Rusty Rust" screensaver. Myakka River State Park is one of Florida's oldest, largest and most diverse state parks, flowing through over 45 square miles of wetlands, marshes, prairies, pinelands and woodlands. Myakka is a wonderful landmark for hiking, fishing, camping, and wildlife observation. Explore the park's scenic beauty by foot, bicycle, horseback, canoe or car. Myakka River State Park is truly one of the premiere bird and wildlife observation parks in Florida. Cloudeight would like to express our thanks to Rusty for allowing us to use his original photography to create this screen saver. Please take this opportunity to visit Rusty Rust online. You will have the opportunity to tour his art gallery and learn more about him. At the top right you will see a small preview of "Myakka Sunset Sky" members only screen saver. The images have been reduced greatly in size for presentation purposes. The images in the screen saver are large, high-quality, high-resolution images which we are sure you'll find stunning! Please click here to download your free copy of "Myakka Sunset Sky" members only screen saver! We hope you enjoy watching it over and over! Thanks for being a Cloudeight member. We appreciate it very much! Happy Emails Made Easy! Cloudeight Smileycons! Click here Now! All content is copyright © 2004 by Cloudeight Internet (all rights reserved) All images included are copyright © by D. Rusty Rust and used with permission.